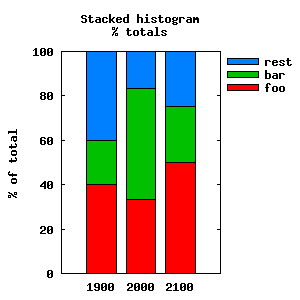 Since gnuplot cannot generate pie charts an alternative are stacked histograms. In fact stacked histograms are even better in my mind since one can put the histograms next to each other and this allows better comparability than looking at a number of pie charts. A single pie chart might make sense but in reality it's more often about how does the current chart compare to a previous one. Here I present an easy example how to generate stacked histograms (available in gnuplot since version 4.1). For fancier examples go to the Gnuplot histogram demos. We have 1 row with header information and 3 rows of data. For each year we have measured 3 values foo, bar and rest which we want to show in graphs in two different ways. The first graph shows the stacked histogram with the nominal values of the data i.e. the height of the first bar is 50 (=20+10+20). The second graph shows the percentage distribution i.e. all values are scaled to 100. The same nominal '20' in graph 1 leads to percentages 40, 33.3 and 50 in graph 2. One box of this type of graph is often depicted as a pie chart so rather than comparing 3 pie charts (one for each year) here we have 3 boxes in one graph, much easier to compare. 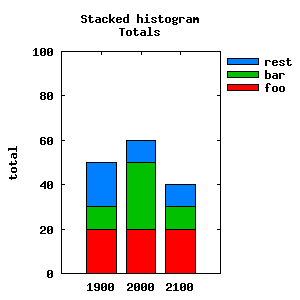 set title "Stacked histogram\n% totals"
set ylabel "% of total"
# the titles via 't 2' aso.